#1 - Unveiling Crime Lord King Babah - "The Revelation of King Babah| Crusher Comics Year Three (1990-91)"
Dean was a hard-working goodie-two-shoes cub scout who became disillusioned with society's ills and moral decline. Hates drugs and crime, and builds an armored suit and wields a massive gun (of unknown make and origin). Teams with Slasher. A Japanese immigrant who came to America to find his relatives, deceased sensei's surviving protégés, and select American masters to complete his training in bujutsu. Meeting the Chrusher while fighting a mutual enemy, Matsuo took Chrusher under his wing to teach him purer bujutsu after Chrusher's American martial arts teacher was murdered via expert fashion; presumably by a disciple of kan-aku na ninjutsu, and possibly darker, more sinister disciplines. A villain that entered the Chrusher Universe under mysterious circumstances, Babah is a foe of unimaginable power. Believed to be the boss of a criminal underground, and is known to possess powers that nobody understands. He has a deep knowledge of the Conquerors, but then disappeared after a confrontation with Chrusher. Wears energized armor and wields an ancient sword powered by a mystic stone. Masked, nobody knows his true identity, but his knowledge of the Conqueror/Welforce conflict is suspicious, since nobody else even knows who they are. Cover from 1990-91. Pencil and colored pencil on art sketchbook, deteriorated due to over-handling. It is the year 1991, and a new villain has been revealed. As seen in last season's "Last DaYz of the Glare", someone has been trying to assassinate Chrusher, hiring his friend and fellow Conqueror RaYzor, mutant-like gangsters, Ninjas, his greatest foe Obliterator, and even a now perished girlfriend. The greatest challenge lies ahead for the Conquerors - Oswegonian High School Justice-Seeking Vigilante Team. 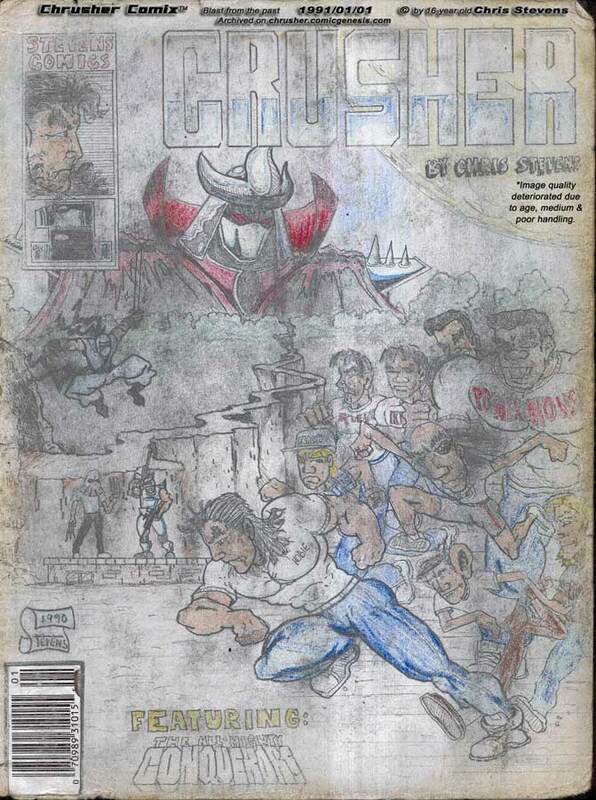 Author's note: The 3rd season of Chris' Crusher Comics (portmanteau is ChrusherComix) began a far more grittier storyline with somewhat more edgy artwork (and far more detail). The greatest growth in art quality is seen between the 1st and 3rd year of my comics, all seen here on this website. Even so, typos (well, misspellings, as I hand-wrote all the text) are often seen, as well as MANY pencil smudges. My high school art teacher - a talented painter whom I greatly respected - appreciated my pencil work, but suggested to me to ink my work to preserve it, to which I did in the following season, 1992. Enjoy VOLUME 3!